Spring, I think you’re here. Finally. Why did you make us wait so long? You’re going to stick around for awhile to make it up to us, right? We’ll now be blessed with endless 70 degree days with light breezes and lots of sunshine. Sweet relief from the cold means I’ve been celebrating in lots of ways. Running in shorts (miracle!) and with the Indy Runners group. I like having running companions to keep my mind of off the actual run some days. Yesterday I showed up for the Tuesday run at Hinkle Field House on Butler’s campus ready to do four, maybe five, miles. Thanks to the girl I ran with, I ended up going six miles! May is Race Month in this fair city and the Mini-Marathon is the kick-off for a month of festivities leading up to the Indy 500. 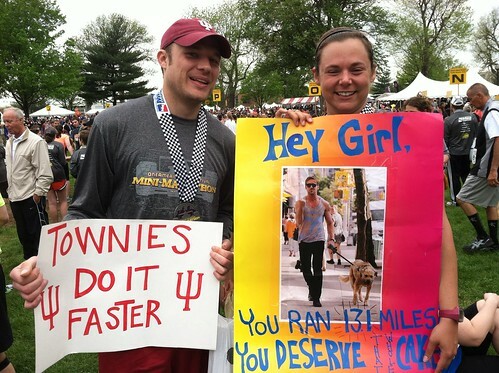 Biggest half marathon in the country, what what? I opted for the role of cheerleader this year instead of runner, which I thought would be very difficult. I’m a pretty competitive person, especially when it comes to races. But I remembered how much I appreciated the support of my friends along the race course last year, and I was excited to cheer extra loudly in the places where I remembered feeling the most tired. My friend Sam and I biked to around mile 9 and then maybe .25 mile before the finish line. Extra perk? En route we go to see the wheelchair racers and the insanely fast top finishers (can you imagine running 13.1 miles in just over an hour?! ), a part of a race that I never get to see as a participant. The sheer athleticism of these men and women blew my mind. 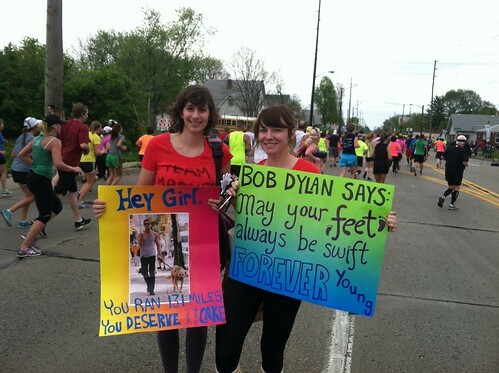 Our posters (yes that’s Ryan Gosling and Bob Dylan) got plenty of head nods and smiles from random runners, but we cheered extra hard for our friend Marnie and her fiance Jannson and my two other friends that we happened to see run by. We even ran along the sidewalk for the last .25 miles with Marnie, screaming her name the whole way. I am beyond proud of these two! Can we talk about driving with the windows open and music blaring? It’s one of my favorite warm weather pastimes. Right now I could listen to Patty Griffin’s new album American Kid all day. The first song feels like the perfect summertime folky anthem to me. Back to running. It’s cool, it’ll lead to epic spring food. In starting to think about training for the marathon I’ve signed up for this fall, I’m considering my diet. I know that the more miles I log, the hungrier I’ll be, but I do not want to just stuff myself with tons of pasta, as amazingly appealing as that sounds. So I’m focusing on fueling with lots of fruits and veggies and healthful proteins like beans and lentils. To kick start this fresh new diet I did a really great three-day juice cleanse from Natural Born Juicers. If you live in Indianapolis I highly recommend checking them out. I’m now a few weeks out from having finished the cleanse and am back to my marathon fueling diet. I’m actually really missing my morning juices and how awake and strangely full they made me feel, so I’m thinking of going in on a juicer. On top of that spring has brought the most magical produce to the farmers markets. Slowly at first, but surely. A few weeks ago radishes and pea sprouts started to show up, and so I rejoiced. This time of year is perfect for buying lettuce and any other awesome vegetables that catch your eye and making a huge salad. I’d love to give you a recipe for this, but I feel like that would just be limiting, so here’s a basic guide. Pile your plate with lettuce (mine, year round thanks to hydroponics in greenhouses, is almost always from Eden Farms). I like a mix of lettuces to give my salad a little more flavor and depth. Chop up a variety of vegetables, whatever is pretty and bright and catches your eye at the store or market. 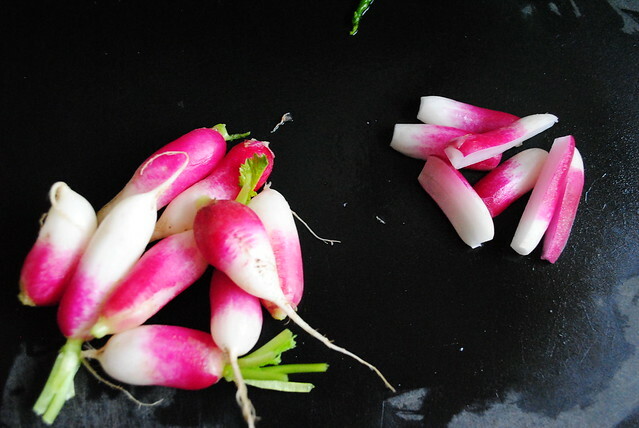 I went with pretty pink and white radishes and sweet pea shoots from Harvestland Farms. Never had pea shoots? Me either until this salad! They taste like peas, not surprisingly, but before peas come around. Like a pea preview. Maybe add a squeeze of lemon over things now. Add some fresh herbs if you have them on hand. 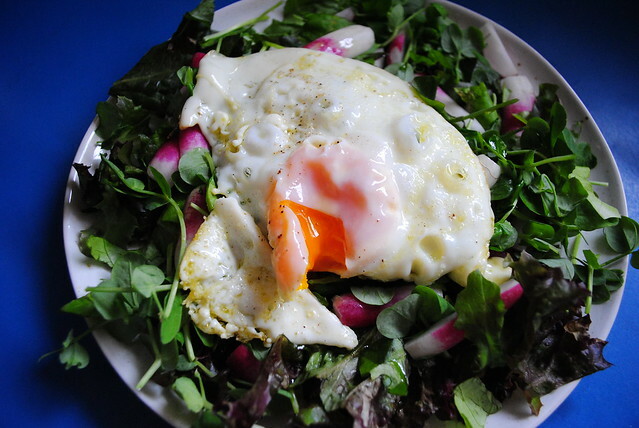 Any good salad, or meal in my opinion, is topped with a soft yolk fried egg (my eggs always come from Schacht Farm, I love them, eggs and people, so much). Fry one up with a bit of salt and pepper, or poach it in olive oil like Oh Joy, which is what I tried out for this salad. I liked this cooking option, because it a nice amount of olive oil to drizzle over the salad as dressing. 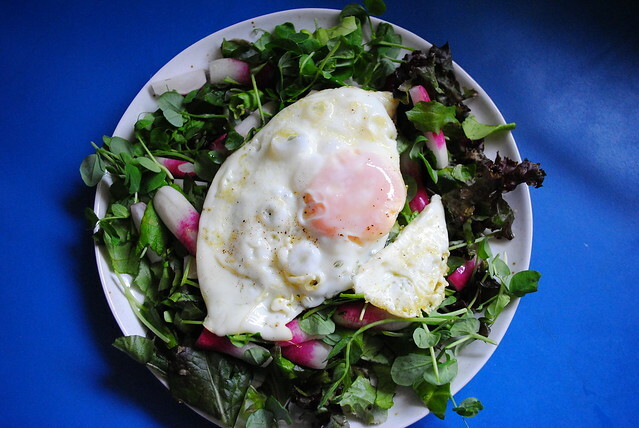 Break open that egg and let the yolk get all cozy with the lettuce. Heck yes, spring!